Temperament: Friendly, full of character and a bit of a chatter box! Hi my name is Angel. 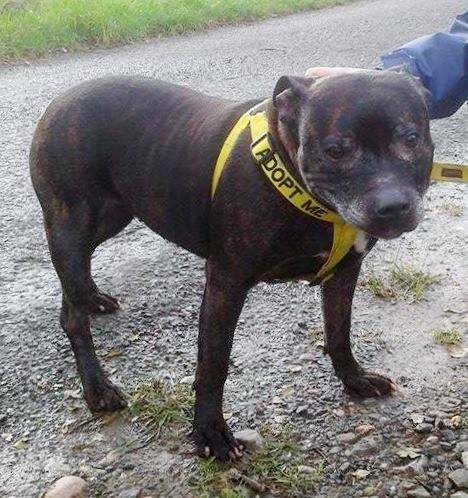 I arrived in the safe hands of Senior Staffy Club after being found as a stray and taken to the pound. I have made lots of lovely human friends since I have been here and enjoy lots of nice walks. When we first set off on our walkies I cant wait to get out and I may pull a little on my lead but after a while I will settle down and try my very best not to. I am a very friendly girl and I sit nicely for treats. I have been told I have a lovely little wiggle when i walk too. Some of my human friends have said I am a bit noisy sometimes, they say I bark with excitement and like to sing songs. I do like to sing and make a bit of a noise just to let you know im here and waiting but when you give me a cuddles I will stop and enjoy your company as that is all I want reallysome attention. I enjoy walking with the other seniors here at the kennels and greet them very nicely but I would be happier if I was the only pet in the home please. Its just I like to play chase and so think I am better just meeting other furry friends and saying hello out on my walk on my lead, woof woof!. I travel well in the car but I like to sing a song on the way and ask if we are nearly there yet. It is just that I am eager to get to where we are going you see, im excited for our adventures together. I will make you a wonderful companion and have lots of love to give so please love me and let me love you too. 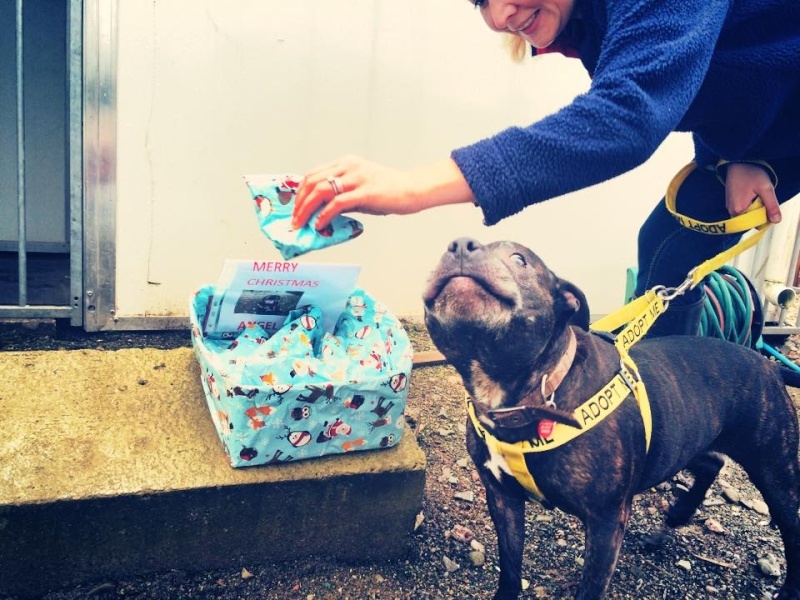 If you would like to offer me a home please contact Senior Staffy Club it tells you how to below. Angel is spayed, vaccinated and microchipped . but can be rehomed anywhere in the UK, pending a successful home visit.